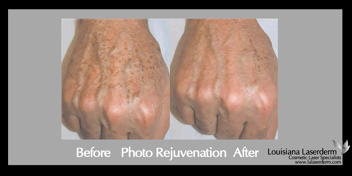 Photo rejuvenation refers to reversing the visible signs of sun damage. This procedure can be performed anywhere on the face or body. 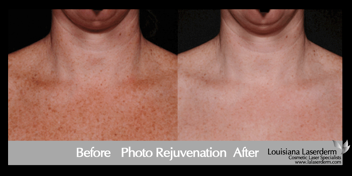 At Louisiana Laserderm, we customize your treatment options based on several factors of sun damage. We have the ability to select between a variety of treatment options to give you the best possible outcome. 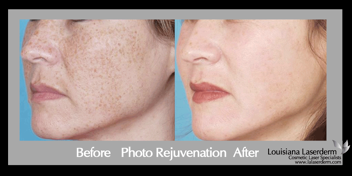 We carry the latest in products, Lasers, and IPL technology to correct a variety of skin conditions such as brown spots, broken capillaries, facial veins, Rosacea, and general photo-aging due to sun damage. 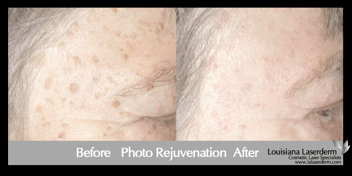 We can diminish sun and age spots in as little as one treatment.